Can Fury complete one of sport’s greatest comebacks? The build-up to any big boxing event is often lively. This has been crazy. Firstly, there was the pre-fight news conference, which was very nearly a fight, before the fight. Watch as Fury and Wilder clashed on stage in Los Angeles. We have a guy in Deontay, whoever he hits with that right hand is going to sleep. And then on the other hand we have Tyson who, for 6ft 9in, is so elusive and quick on his feet. It’s going to make for a great fight. There’s so much on the line in this fight. In my eyes, whoever wins this fight is the number one heavyweight in the world and has to fight Anthony Joshua next year. Christmas is sorted. Just bought some of these to wear while I eat the roast dinner. Expandable waistband and camouflage design, they won’t be able to see me when I go for the bowl of pigs in blankets. This theme that Wilder can’t box – look back 10 years ago and he won bronze at the Olympic Games. He reached the semi-finals three years after taking up the sport. He lost to an Italian who in the previous round had beaten Oleksandr Usyk, a man who graced us with a superb display against Tony Bellew this month. You can’t compile that form if you are just a slugger. This is the man who rocked Mike Tyson’s world when no one else thought it could be rocked. James ‘Buster’ Douglas delivered one of the greatest upsets sports has seen in 1990. He’s 15ft from the ring and a magnet for selfies. A brave, brave effort from Great Britain’s Jason Welborn, but his attempt to grab the IBF and WBA world super-welterweight titltes from Jarrett Hurd has been unsuccessful. He does not get up from that body shot in time and it is all over in the fourth round. 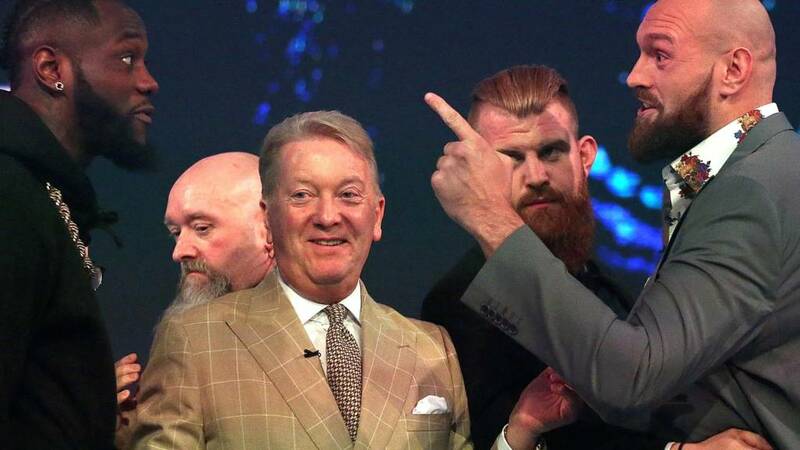 That means Deontay Wilder versus Tyson Fury is next. A huge attack from Jarrett Hurd, a brutal body shot and Welborn crumples. He had enjoyed a great third and bright start to the fourth, but the American made the breakthrough and then took full advantage. Anon: Don’t listen to the haters, most of the country and anyone that knows anything about boxing is behind you tonight @Tyson_Fury. Good luck and bring it home! Jukebox Jack: No matter what happens in that ring tonight I have found so much more respect for Fury for making it back to the big time! If he wins this, it will be the most awesome comeback since Schwarzenegger won Mr Olympia again in 1980 without anyone knowing he’d be competing! Welborn on the attack in the fourth. What an upset this would be. Three rounds gone in the IBF / WBA world super-welterweight championship fight and it has been a hugely encouraging performance from Britain’s Jason Welborn, who enjoyed great success at the end of the third. Mike Costello and former world middleweight champion Andy Lee. They’ll be filling the airwaves on BBC Radio 5 live. Speaking to Lee, he thinks Tyson Fury doesn’t need to be brave tonight. Make it ugly, move, don’t commit too much. That may not make for a rip-roaring slug fest but ultimately it’s all about the result. We’re live on BBC Radio 5 live right now, so press the play button at the top of this page to listen along to Mike Costello, Andy Lee and Abel Sanchez. OK, we know this may well annoy you. Sorry about that. Meet Falco, he’s over from Frankfurt, Germany and get this – he’s a Tyson Fury supporter. There are plenty of Brits in town too, these gents from Yorkshire stand out a mile. This week three years ago Tyson Fury was doing this. Toying with Wladimir Klitschko. It will be some effort if he can do the same tonight to Deontay Wilder. Matt Edgley: Just got up! I’m 47, the 1st fight I remember is Minter v Hagler. I can’t remember being this excited for a fight since Hagler v Leonard. I so hope Fury wins. Can he do it? Avoid the right all night & conjure up the ghosts of victories past. Hope so…..
Anthony: Here on the beach in Mauritius its 7.40am and a reasonable 25c go Tyson! Thankfully BBC radio is reachable here. We’re not jealous of that at all honest Anthony. Honest. Welcome wherever you are in the world. Always in the market for some pictures if you’re following our coverage in some exotic places. Outside the Staples Center there’s a temporary ice rink for those seeking a festive skate. All that’s missing is Kevin out of Home Alone. Then directly outside the arena are legends cast in bronze. Oscar De La Hoya is joined by the likes of Magic Johnson and several more. There’s history on this patch of concrete but all you can hear is “one Tyson Fury” from the bar on an adjacent corner.